In this digital era, there is almost nothing that you can’t do with the help of technology. Our smartphone is one of the most advanced pieces of technology that we all carry in our pockets all the time. It has replaced our daily needs of carrying a music-player, digital camera, phone, telephone diary and even the maps. You don’t have to carry all that because your smartphone can do everything. Google map is something that everyone love to use, as this digital map service not only provide you with the directions. But also able to provide the different alternatives, short-cuts, the distance between two points and expected time it will take you to reach your destination. It is handy for sure, but they are not accurate, sometimes your google map can lead you to a completely different destination, making you feel lost. Pointing at one of such issue this Goa banner has gone viral. 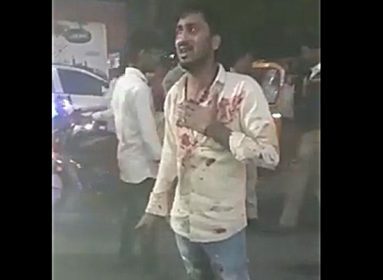 What was written in the viral Goa banner? Google maps is one of the most reliable digital apps in the world. People moving to a new city, state or country don’t have to worry about the routes and places around them. Moving to a new city wouldn’t be so easy without google maps. But you should know there are times when google maps make mistake by leading its users in the wrong direction. 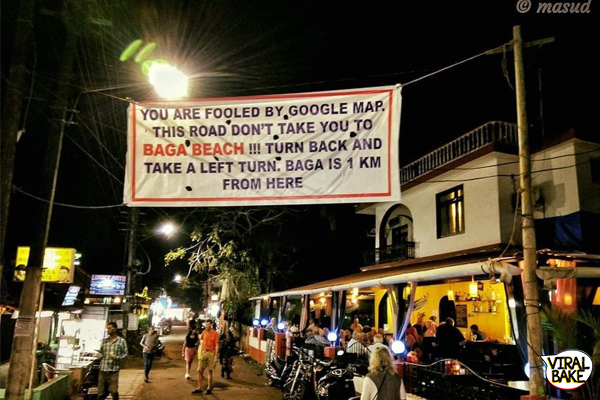 The route to Baga beach in Goa is one of those places where Google maps often make mistake to chart the right route. This banner is hung over the market area which is Google mistaken as your destination (Baga beach). There are many people who have been fooled by Google in past and for that reason, this Goa banner tweet has gone viral. As a result, some people are thanking the person who has decided to hang this witty instruction banner. While others are sharing their stories of getting fooled by Google. Tell us if you have even fooled by Google?